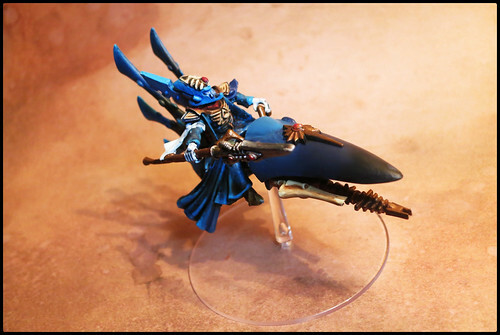 As I mentioned last week, my friend Graeme, whose Aspect warriors I have been painting, created a rather cool conversion to serve as the leading Warlock for his Eldar warhost, and I got the opportunity to paint it up for him! I think it came out quite nicely. 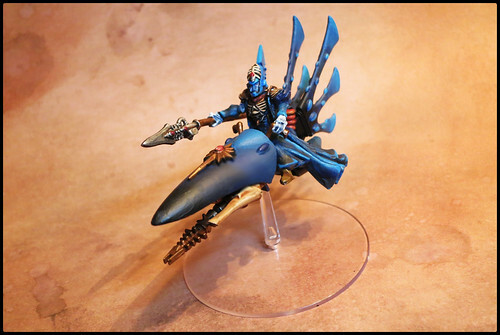 His army has a blue theme to it so I went with a graduated type design for the hood, that is then replicated in the flares at the back of the bike. Should make him stand out nicely as a centerpiece of the army!